When a customer gives you their email address, you both enter into a contract. They give you that personal information because they trust you. They trust you to use that information to provide them with helpful, useful content that concerns you both. Subpar email marketing is an abuse of that trust, but interesting, well thought out, quality email marketing will strengthen a budding relationship. Email marketing is important no matter what field of endeavor you may find yourself in. Follow-up emails, is a crucial step in relationship building. This helps turn prospects into buyers and buyers into repeat customers. Below, are a few things that Dan Kogan says every marketer should be keeping in mind every time they sit down to write something for their email list. The list will sound familiar to Contact List Builder members. “First things are first: You need an audience to send these emails to. A lot of people will throw a signup form up on their homepage and call it a day, but if you want people to actually sign up for your list, you’ve got to promote it. Pretty obvious advice, I know, but I think it bears repeating. In 2016, every business is given the opportunity to also be a content creator. Whether it’s your blog, your YouTube channel or your weekly email newsletter, you are making content for an audience of customers and clients. That audience demands to be entertained. You can start by writing content about a topic in your field that you’re interested in. If they signed up for your list, it’s probably because they share your interests. This is probably the most widely given piece of advice about email marketing. That’s because it actually works. The average person receives about 121 emails per day, so you have to find some way to stand out. Dale Carnegie once wrote, “A person’s name is, to that person, the sweetest, most important sound in any language.” If an email says my name in the subject line I usually open that email before I even think about it. No need to belabor this any more. There are plenty of programs out there that will help you personalize your marketing emails. Most email softwares will automatically generate a responsive email. That’s a great benefit to your company, because a lot of people idly check email on their phone or tablet while they’re sitting around waiting for a train, or in line at the lunch counter. However, having an email that looks nice on a smartphone doesn’t help you very much if it links to a landing page that isn’t responsive. That’s a recipe for a sky high bounce rate. Google has reported that 61% of users are unlikely to return to a mobile site they had trouble accessing. 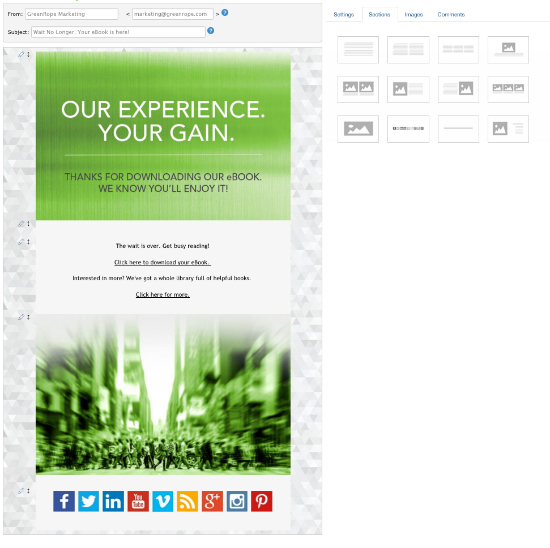 Although, if your website still isn’t responsive, you have bigger problems than your marketing emails. A marketing email doesn’t exist in a vacuum. It’s (hopefully) the first step in a series of decisions that lead to a conversion. If your email links to a generic homepage, that’s probably a waste of a click through. Make sure the links in your email are directed at landing pages for specific products and services related to the content of your email. Take your marketing emails seriously. Don’t send them just because you feel some sense of obligation. Make each missive an opportunity to connect with a customer who’s interested in your business, and who values your opinion.